I first made this salad last Spring and it was a huge hit all season long! 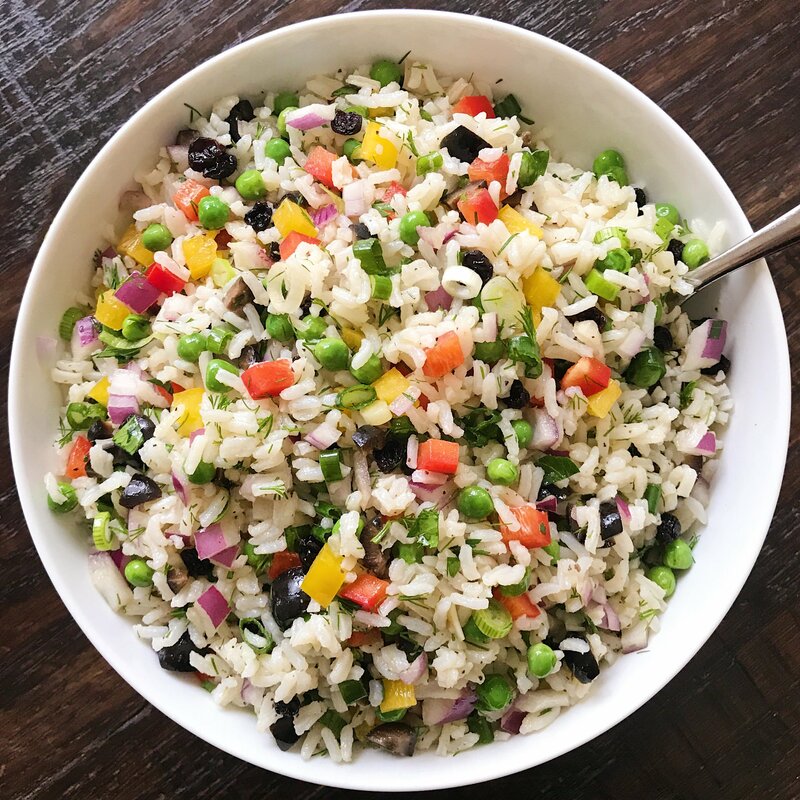 It’s rice + a ton of diced vegetables and herbs, all tossed in a dijon-balsamic vinaigrette. It’s the type of salad that goes with everything… it works well with a grilled protein– chicken, steak, tofu or burgers of any kind, or even other grilled vegetables. It’s packed with flavor but no one flavor is overpowering, it’s light and refreshing, satisfying and crowd pleasing. It is made with real, whole foods and is adaptable to tastes. You can add your favorite veggies or skip some. 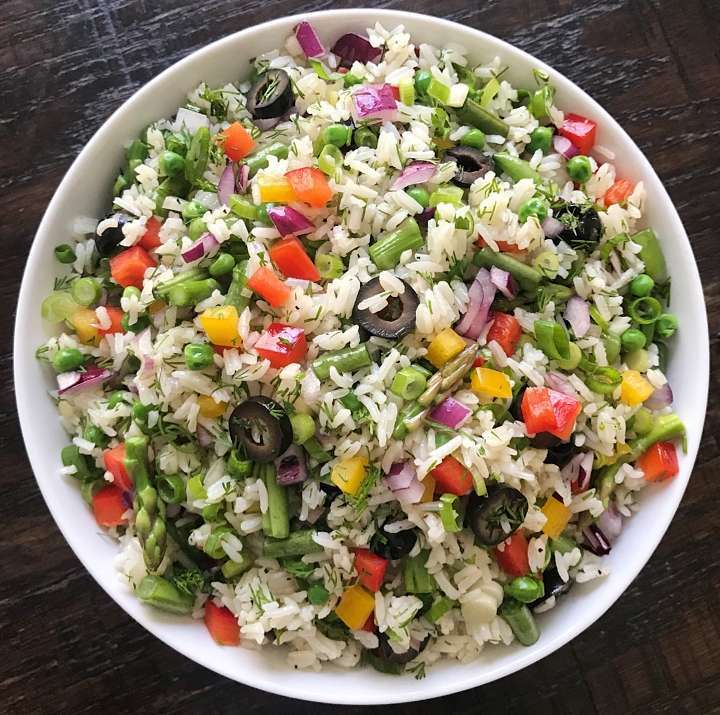 Last year I made it with cooked rice, red pepper, yellow pepper, red onion, scallions, shallot, petite, black olives, parsley and dill. Recently I made it again but added some more greens! 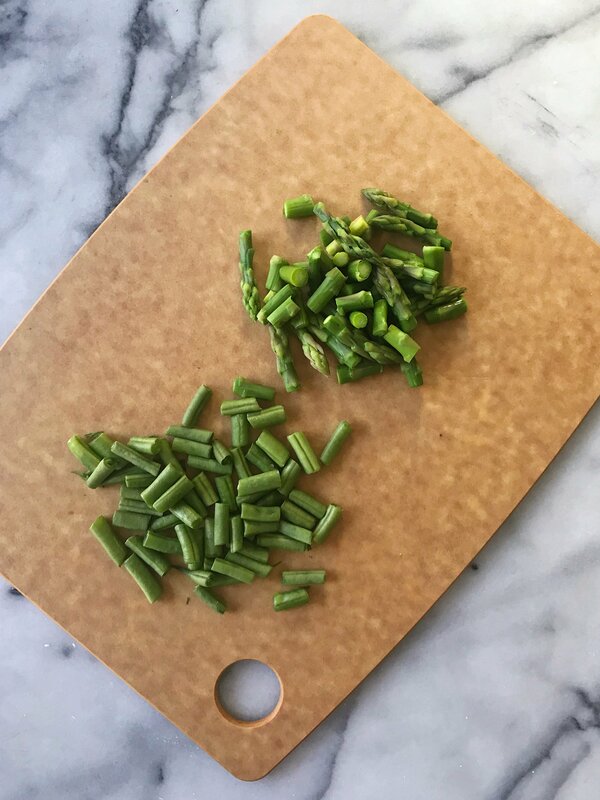 Some steamed asparagus and some green beans. I loved it with the additional greens! I love the flavor and the texture but you can adapt it to your tastes if you want more rice or more veggies. Best part is it’s super easy to make and makes a large quantity (also doubles well) so it’s perfect for meal prep or a party or just feeding a crowd. Recipe adapted from Silver Palate. This simple gluten-free, veggie-packed salad is perfect for meal prep or feeding a crowd. 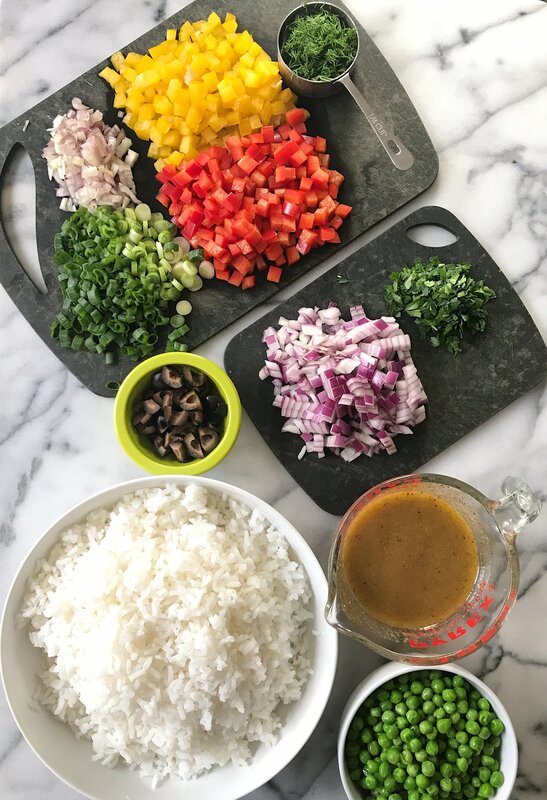 It's rice + a ton of diced vegetables and herbs, all tossed in a dijon-balsamic vinaigrette. It's the type of salad that goes with everything. Recipe doubles well, is easily adaptable to tastes and saves well in the refrigerator for a few days. Recipe adapted from Silver Palate. If you haven't made rice, do so now in whatever method you prefer. We have recently been using a multi pot because it's quick and works every time! If you haven't steam asparagus, so do now too. Combine ingredients in a small bowl or liquid measuring cup and whisk until well combined. Place cooked rice (while still warm) in a large bowl. Pour ½ cup dressing over rice and stir to combine. Add veggies and toss to combine. Taste and add additional dressing, salt or pepper to taste. Serve immediately or store in a sealed container in the refrigerator. Stays well in refrigerator for several days and can be enjoyed cold, at room temperature or warm. Looks wonderful. Making it with Quinoa. Thanks for the super recipe. We all need to eat more of this kind of food. Thank you! I bet it will taste great with quinoa! Let me know how it works out!